There are a lot of books that come out that has romance @ work, romance @ college, fiction @ work. Very rarely we find books that take us atleast 10 – 15 years back in our life where we had the greatest time of our lives as a child. This book is a well deserved addition to that genre. Don’t get carried away by the title. Seriously. No assumptions about the word ” Jiluk ” or fondly called Jiluku. The author has clearly explained the what part at the start of the book. There is still one part of ours that craves to go back to good old days where the biggest problem was to copy the homework before the teacher enters the class and the greatest happiness was when the bell rang for our PT period. This book wakes that part of ours up, asks the part to concentrate and go back to childhood. Every incident or chapter in this book will make you look at the ceiling and think and smile to yourself. There is a great attention to detail when it comes to reproducing the main character’s childhood. The author neither has a big brand of IIM or IIT backing him nor is he a well-known personality with credible achievements in film, theatre, music, sports, culture, and bureaucracy or in corporate India. He never has visited a foreign land nor does he have an overseas work experience of any kind. His blog has never been ranked among the top 100 blogs in the country owing to the simple fact that he doesn’t blog. And one important thing, his earlier novels were not blockbuster hits or runaway bestsellers as this one happens to be his debut novel. His work has never been published in the past by any leading publisher (including the imprints) or has been represented by any agent before. He doesn’t work with a national newspaper or a leading national magazine or lifestyle magazine as a full-time employee or as a regular features contributor one or the other. He neither has won any literary award nor holds some kind of Ph.D in creative writing either. He is just a small town boy with a very big dream of becoming a storyteller someday. This is your time travel ticket to your school days, your first crush, your first winning moments and many other firsts. The best thing about this book is that you will remember your Jiluk as you read through the book. 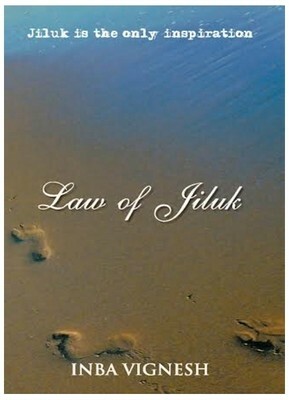 If there’s a place you would wanna spend your next vacation after reading ‘Law Of Jiluk’.. It would be Wellington! The author explains a lot of scientific fundas from Physics, Biology and Chemistry while comparing them with real life in the most humorous way possible. Cricket match is another thing I liked..
And once you people are done reading this book.. I’m sure you would wanna contact me and that’s because I’m soon going to start a new league by the name AXYCL. N this you will know only if you read the book.